This is not the first book to be published on this subject (see for instance Physics and the Art of Dance by Kenneth Laws and Arlene Sugano, or Laws’ earlier volume, The Physics of Dance); nor is it particularly user friendly. Physics and Dance is a collaboration between Emily Coates, a member of the dance faculty at Yale, and Yale physicist Sarah Demers. 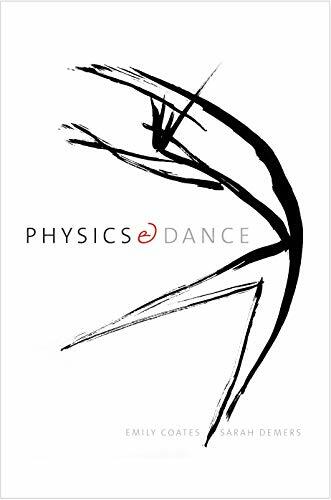 Each chapter focuses on one principle of physics and the way that principle affects dance, beginning with basic Newtonian principles like gravity, force and motion, and moving to post-Einstein principles, energy, space and time. Demers discusses principles of physics while Coates relates the principles to dance through body exercises, dance history, and discussion of specific examples from ballet and modern dance. There are photographs of dancers and diagrams illustrating the exercises as well as formulae to explain the physics. Both authors write clearly and there has been great care to keep the style uniform for the dance and the physics sections of each chapter. The organization of topics is sensible. Both authors offer both theory and the history behind the theory. Coates’s knowledge of a wide variety of dance forms and choreographers is impressive. There are basic problems to the approach the authors use. To fully take advantage of the dance exercises, one would have to have a large empty room like a studio and, for the advanced exercises, a partner. The discussion of physics and understanding of the formulae require a knowledge of calculus. Neither the room and partner nor the knowledge of calculus was available to this reviewer. Moreover, the book, published by a major university press, is too advanced in its language for someone without a passion for, and a background in, both the science and the art. Is a book the best medium for this topic? One needs to see the dancers in motion to fully understand the principles. Unless one is in a center of dance like New York City, one is dependent on YouTube and other electronic sources for examples of the work of the many choreographers discussed in the book. For all the good intentions, comprehensive knowledge, clear writing and copious illustrations, Physics and Dance is a frustrating volume.